Almost 50 new Americans took the Oath of Allegiance during a naturalization cermoney Wednesday, Nov. 7, 2018 at the downtown Kansas City library. Arem Mohammed's white tuxedo flashed as bright as his smile while he sang the national anthem for the first time as a U.S. citizen Wednesday at a naturalization ceremony at the central branch of the Kansas City Public Library in downtown Kansas City, Missouri. Mohammed, 33, first arrived from Northern Iraq about five years ago after working as a translator for the U.S. government. The work was difficult and dangerous, he said, but the reward is worth it. "The government (has) done very good stuff for me here. I'll never forget it. Now I'm a U.S. citizen — I think all the world is mine right now." Arem Mohammed, center, worked in Iraq as a translator for the U.S. government before immigrating to America. He became a naturalized citizen during a ceremony on Wednesday, Nov. 7, 2018 in Kansas City. Mohammed lives in North Kansas City with his wife and three children. He's been working as an Uber driver but said next week he starts training to become a commercial truck driver. 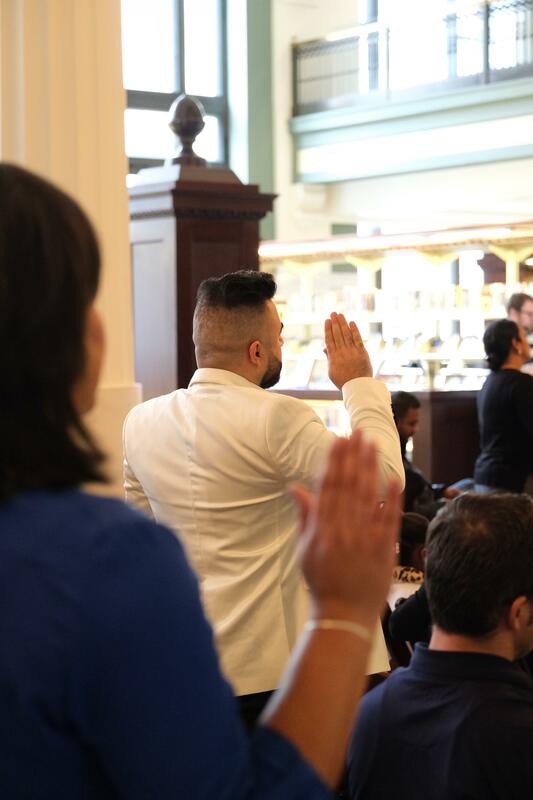 He joined 48 other immigrants hailing from 30 countries taking the Oath of Allegiance. Brian Wimes, a U.S. District judge in the Western District of Missouri, presided over the ceremony and afterward posed for pictures with new citizens and their families. Leo Prieto, a consultant and attorney who was naturalized in college after immigrating from Mexico, spoke to the crowd about the entreprenurial spirit of immigrants and the "beauty of diversity." 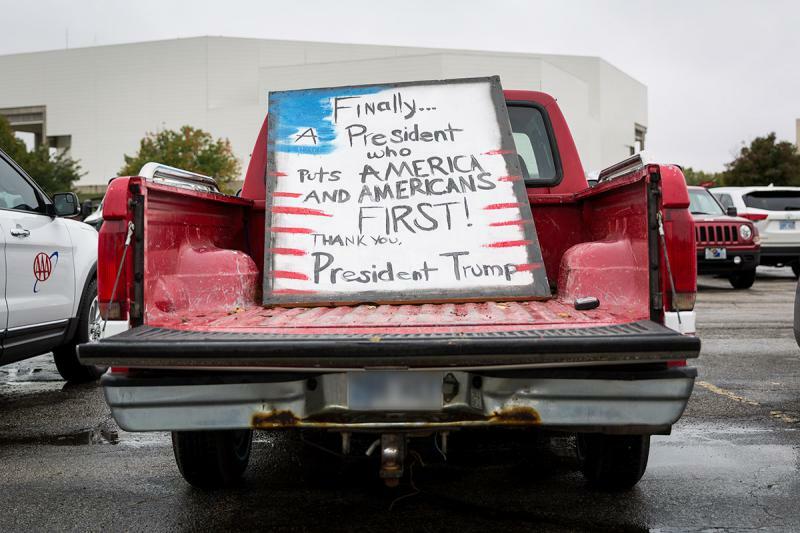 He also referenced the surge in voter turnout during Tuesday's election, and encouraged his new fellow Americans to participate in their democarcy. "What you're gonna have after today — your power to vote — that is going to give you a sense of ownership of this country," Prieto said. "So you can exercise that vote and you can speak. Not only for yourselves but for others that can't speak." For many new citizens, voting is a crucial milestone in becoming an American. On this episode, we find out what issues matter to newly-naturalized citizens both here in Kansas City and across the nation as they prepare to vote for the first time. Plus, a look at the latest episode of My Fellow Kansans. At a campaign rally in Topeka earlier this month, the tough talk on immigration from Republican gubernatorial nominee Kris Kobach was a crowd pleaser. “We’ve worked on a number of things, but the most important is stopping illegal immigration,” Kobach said to a cheering audience. Kobach was standing next to President Donald Trump, who had kind words for the Kansas secretary of state, who’s advised the president on immigration and proposed wording for a citizenship question on the 2020 census.